Before I left on this trip, I made some contacts ahead of time through Couchsurfing, specifically in Khabarovsk and Komsomolsk-na-amure where I am staying in hotels, not with a family. 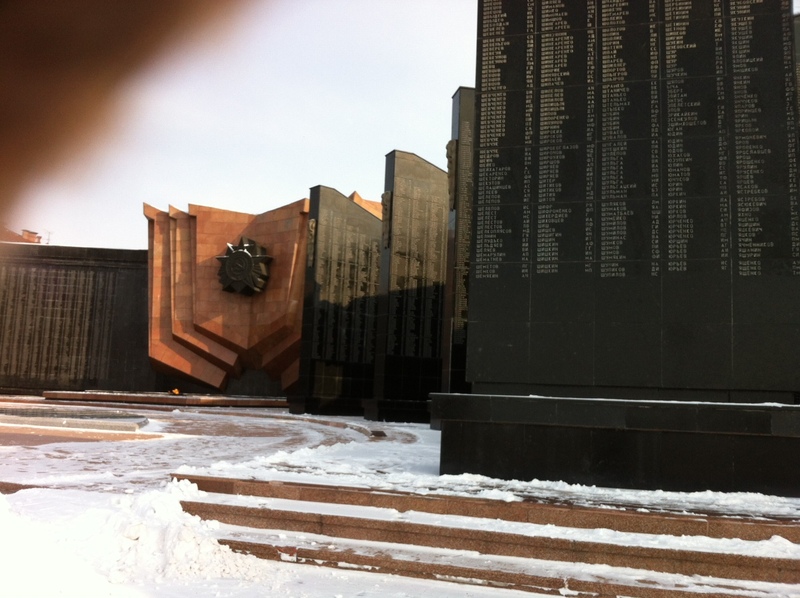 I arrived in Khabarovsk at around 4:30pm on Monday. My Couchsurfing buddy, Aleksey, was kind enough to meet me at the airport. From there he took me to buy a SIM card and to my hotel. A few words about Aleksey– he is 29 and a local representative of a German company that sells ship-building equipment. His Couchsurfing profile said he was the kindest person on the planet and I have to agree. First of all, my flight was delayed so Aleksey wound up waiting an hour for me a the airport. Then, the SIM card errand took another hour and a half, because of lines and sales staff confusion. Then we got stuck in traffic for about another half hour. 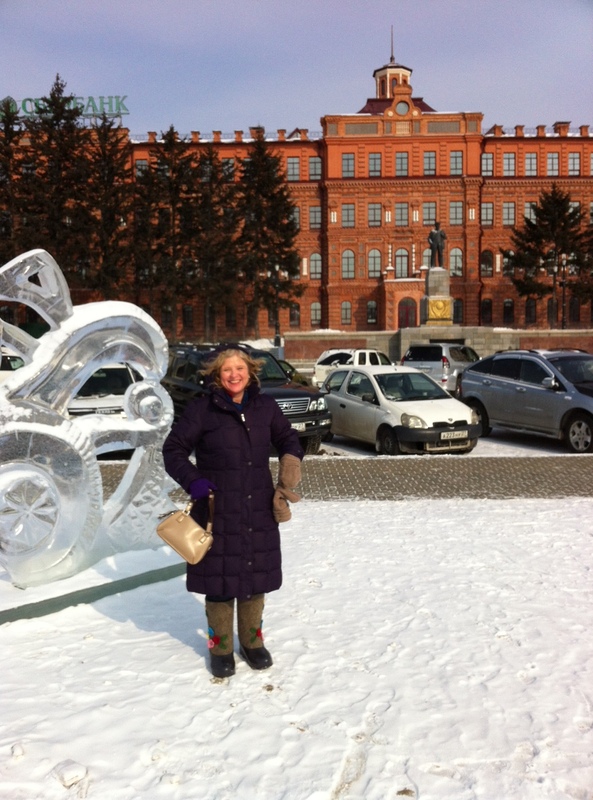 By the time I arrived at the hotel, I had eaten up about four hours of Aleksey’s time. Plus, after leaving me at the hotel, he got stuck in traffic again which totally messed up his plan to go to the gym. Although he offered to hang out with me in the evening, I was just too exhausted. I had a quick and delicious dinner in the hotel restaurant (borscht). Tuesday morning I headed out for a walk and to see the Regional Lore Museum. I bundled up in my long coat, mittens, valenki, etc. Soon after beginning my walk I started burning up! So I put down my hood to try and better regulate my temperature. This provoked scolding from some concerning babushkas. Undaunted, I pushed onward toward the riverbank. 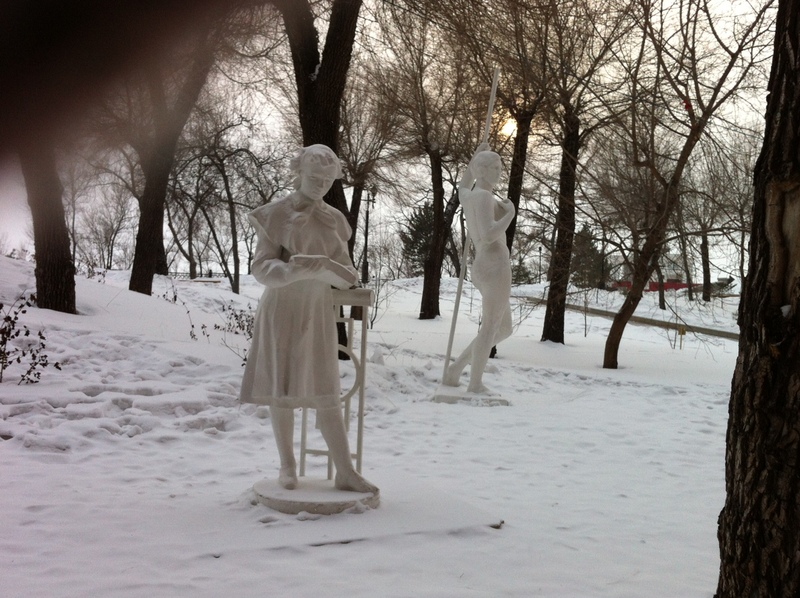 After trudging through the thick layer of snow covering the frozen river, I went to the Regional Lore Museum. What an interesting museum! There was a traveling exhibition on the history of Soviet opposition to the Russian Orthodox Church. It included several COLOR photographs from the 1880’s. These photos were the result of a new technology developed by the photographer himself. As war broke out, he sent the photos away for safekeeping and so they survive to this day. Aleksey called to meet up for lunch. He picked me up at the museum and took me to what he said was a typical student cafeteria. It was very inexpensive and quite delicious. Then he took me on a little tour of Khabarovsk, every stop of which he explained would look better and be more interesting in the summer. But for me, I was still charmed by the city. The city center has preserved many pre-revolutionary buildings and devotes a sizable area to parks. The main square, Lenin Square, was decorated with ice sculptures and a Lenin monument, naturally. He also took me to the war memorial dedicated to those from the Far East regiment who perished during the Second World War. 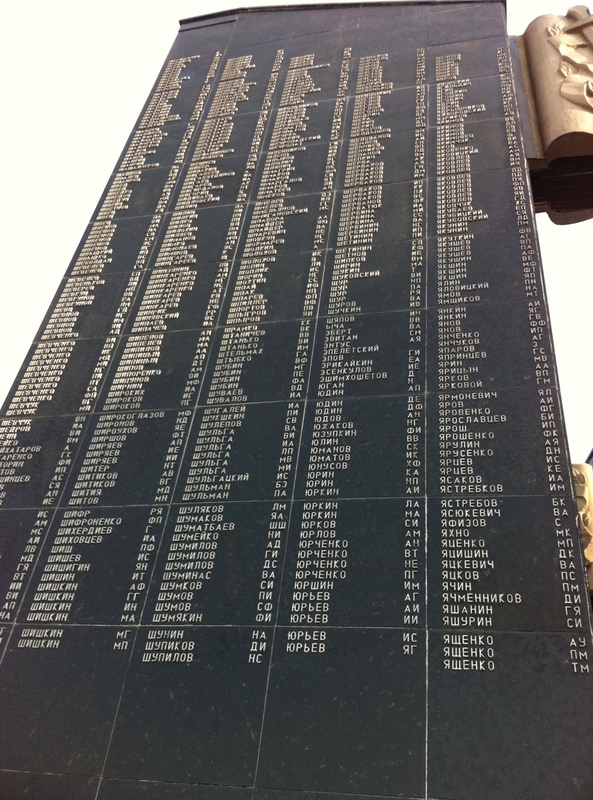 The monument was colossal and included the names of the dead etched into the granite. Aleksey needed to get some more work done so he dropped me back off at the museum at around 4. This time I lingered over exhibits on the history on the collectivization after the revolution, the Civil War, and the first World War. What chaos– it’s still hard for me to imagine how Russia survived all these wars of the early 20th century all at pretty much the same time. The museum included objects from everyday life of the time: embroidered clothing, furniture, tea sets, cigarette packages. The section of the museum of the 50’s seemed to be the most interesting, with soda water machines, posters, records, clothing, etc., but, unfortunately, the museum closed at six and the museum ladies rushed me out the door. Visiting museums like this is a perfect example of why traveling alone can be a good thing. There are few people I know who would have tolerated spending such a long time at this museum but I completely nerded out on each and every exhibit. If I were a Trekkie, this is not just my Star Trek convention, this is my three-week-trip on the Enterprise itself. After the museum, I went for a stroll nearby to see sculptures crafted out of whale bone. 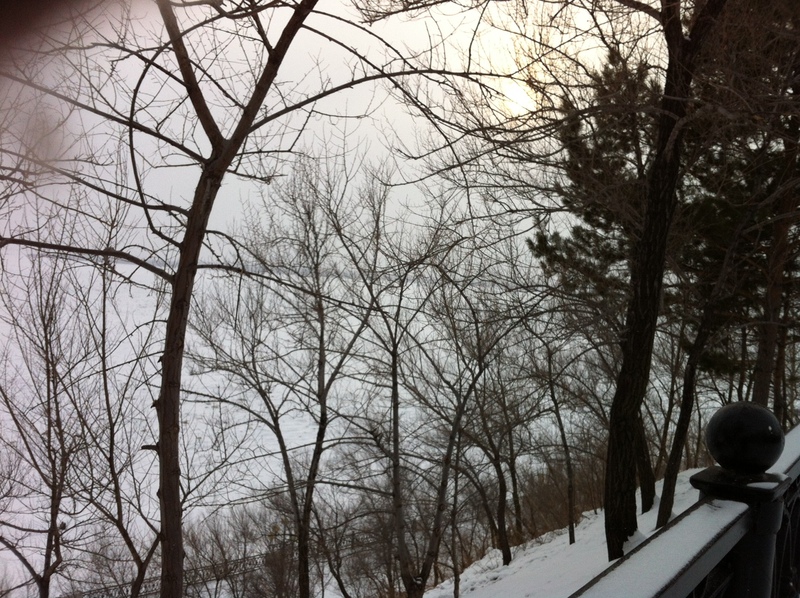 The sun was lower in the sky now and shimmered through the tiny snow flakes. I stopped at a cafe for tea and blinchiki and then returned to my hotel to wait for Aleksey. He, again, kindly took me to the train station, waited with me until the train was called, and then settled me into my train compartment. This was extremely helpful because to get to the platform you had to climb three flights of stairs in the cold. I know I would have had a very difficult time carrying my luggage up the slippery stairs by myself, not to mention getting the bags up into the train. Then I bid farewell to Aleksey, the gift from heaven, and settled into my kupe. My travelling companion in the train compartment turned out to be a young woman (late 20s?) named Vika who was on her way to Komsomolsk for a business trip. She works for L’oreal and Garnier. We chatted as she clicked away on her laptop and fielded phone calls from colleagues. I realized it has been about 10 years since I have been on an overnight train in Russia and a LOT has changed. The most important change is the toilets. Before, the flushing mechanism was simply a pedal that dropped your “deposit” straight onto the moving tracks below. Because of this, the toilets were always locked a half hour prior to arriving at any station and they remained locked while at the station. Finally, a half hour after the leaving the station, the toilets would be unlocked again. I had wondered how my backside would fare against the freezing temperatures, but I shouldn’t have worried. Russian trains have now installed biotoilets! So now you can go to the bathroom whenever you wait, station or no, and the bathroom is as warm as the rest of the train. 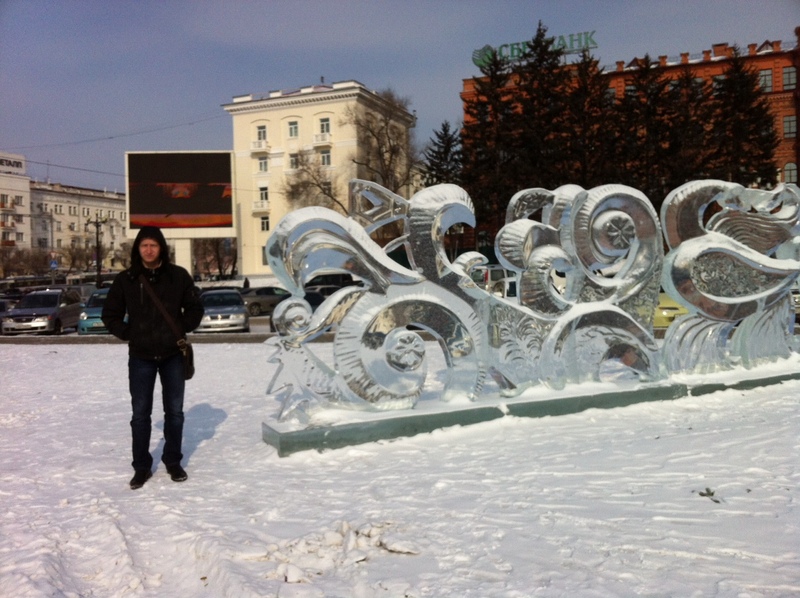 Upon arriving in Komsomolsk I wondered how best to get to the hotel. It was very close to the train station, but we had arrived before the snow plows had come through so I wasn’t confident in my suitcases’ wheels. Luckily, Vika was also staying at my hotel so we hopped in a taxi with her work colleague, checked in and had a gigantic breakfast. Then I took a nap. 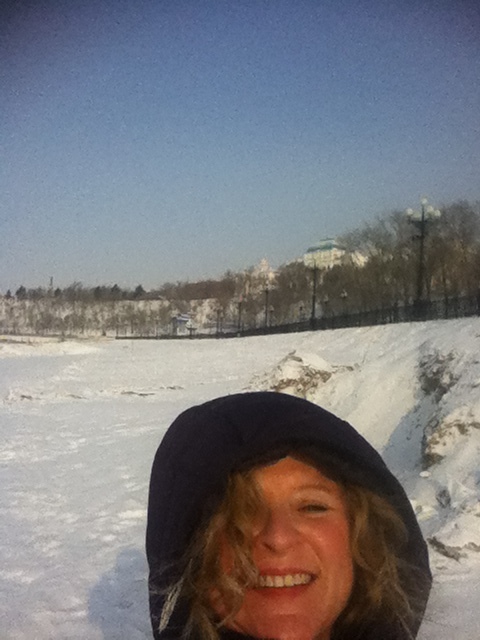 In a couple of hours I will meet my Komsomolsk Couchsurfing buddy, Tania! Good job! I enjoyed reading your narrative. Good way to see things through your eyes. Keep ’em coming. BTW, they’re also very reassuring to a Mom!